Carol Channing - Call on Dolly! You're still growin', you're still crowing', you're still going strong. For everyone else it was scary. And Our Hearts Belong to Mary. Carol Channing transitioned in Rancho Mirage early Tuesday morning, January 15th, 2019, just 16 days shy of her 98th birthday. She was known for several decades of achievements on both stage and screen. She had three Tonys, including one for lifetime achievement in 1995, and also received honors for her appearances in shows including Gentlemen Prefer Blondes, The Vamp, and Lorelei. But the real crown jewel in Channing’s career is the role that will forever belong to her: Dolly Gallagher Levi in Hello, Dolly! Carol learned early on that center stage was the "safest place in the world to be." Who would have guessed on that January night in 1964 that the Jerry Herman musical Hello, Dolly! was going to be one of the biggest Broadway hits of all time and that 55 years later we would still be celebrating it? The question is rhetorical. Carol Channing was born in Seattle, Washington, on January 31, 1921, and grew up in San Francisco, California. During her career, she starred in movies, performed in many Broadway plays and musicals, and had her own nightclub act. Besides Dolly Levi, she also made famous the character of Lorelei Lee in Gentlemen Prefer Blondes (1949), singing “Diamonds Are a Girl’s Best Friend.”Carol learned early on that center stage “is the safest place in the world”. 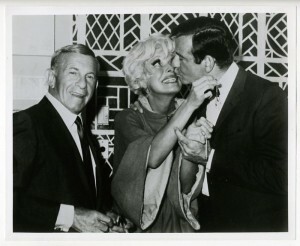 A girl with ideas and a purpose in life is Carol Channing. Carol is the girl who stood before a big crowd in Veterans Auditorium last Thursday and won the statewide oratorical contest in which 10,000 high school students entered. Car ol is 16, has golden hair and brown eyes, lives at 1230 Washington Street with her parents and attends Lowell High School. Carol likes dancing and acting best, and public speaking next. She was to have attended summer dancing school at Bennington College, Vt., under such well known teachers as Mary Wigman, Doris Humphrey and Martha Graham. But with the trophy she won on Thursday goes a trip to Honolulu, so Bennington is out of the picture. As for acting Carol has the feminine lead in “Kempy,” the annual play to be presented at Lowell shortly. Her favorite sport, though, is impersonating actors and actresses. She has a golden voice that she hopes some day will carry her to fame. And with all her extra-curricular activities, Carol is a scholar. Two years ago, at Aptos Junior High School, she won the American Legion award for all around achievement, scholarship included. Perhaps most important of all to the success she hopes for is Carol’s rare combination of modesty and assurance. She was at perfect ease meeting an interviewer in the living room of her home yesterday. It’s great to go back and read about a young girl who had so much promise. Carol Channing....Channing has been married four times. Her first husband, Theodore Naidish, was a writer. Her second husband, Alexander Carson, played center for the Ottawa Rough Riders Canadian football team. They had one son, Channing Carson. She was then married to Charles Lowe, who managed a highly successful career for Carol for the 46 years they were married. Her last husband was Harry Kullijian. It was Marge Champion who brought Channing to the attention of husband Gower Champion, who, in turn, cast her in Lend an Ear, the 1948 review that established Carol. 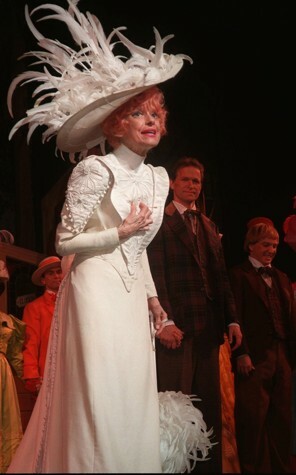 Dolly Levi in Hello, Dolly! would solidify her position as a bona-fide Broadway Legend. In 1963, it was decided that there was going to be a musical version of The Matchmaker, by Thornton Wilder. What was not known was that the show would create history. Harold Prince, according to Carol, attended the Detroit tryout and urged the removal of the title song! The Broadway of the early 1960s was lit with marquees of HOW TO SUCCEED IN BUSINESS WITHOUT REALLY TRYING, A FUNNY THING HAPPENED ON THE WAY TO THE FORUM, and NO STRINGS at the Broadhurst. There were MARY, MARY; CAMELOT, sans original cast; Nancy Dussault in THE SOUND OF MUSIC. Although MILK AND HONEY did not have Jerry Herman’s name on the marquee, it did proclaim “A Rousing Melodic Hit!” CARNIVAL! – with exclamation point – was first at the Imperial: the names of David Merrick and Gower Champion were most clearly visible. The show then moved to the Winter Garden, the title – sans exclamation point – emblazoned in what would be dubbed, a “David Merrick red.” The names of Merrick, Champion, and Herman would soon be collected for a new show; a show that would always have an exclamation point in its title– on Broadway, or throughout the world. The original working title was Dolly, A Damned Exasperating Woman. How’s that for a title!? The Messrs. Stewart, Champion and Merrick were present and the title was changed. There is no documentation in the piece detailing what type of demo record was used. It is known that the issued promotional 45 rpm recording did identify the show with its new, popular name. 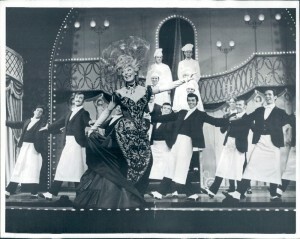 The role of Dolly Levi in the musical was originally written for Ethel Merman. However, Merman turned it down, along with Mary Martin (although each eventually played the role). Jerry Herman had to prove to Mr. Merrick that he was the right person; that he was truly American. Merrick petrified everyone around him; that was his usual way of doing business. Jerry went along with it because he desired the job. Mr. Merrick was difficult and was constantly changing and fixing things. When it came to deciding who would play the monumental Dolly, Jerry, Gower, and Merrick all wanted Ethel Merman. Merman had just completed two years of Gypsy on the road after having done it on Broadway for two years. Exhausted, she was not ready to lead a new musical. She didn’t even want to go to hear the score. Merman told them that she would be frustrated if she liked it because she really didn’t want commit to another show. In light of this, they considered the talents of Nanette Fabray. Merrick then auditioned Nancy Walker. Champion’s definitive 1960′s triumph was Hello Dolly (1964; with 2,844 performances), a musical version of Thornton Wilder’s comedy The Matchmaker. With a giddy score by composer-lyricist Jerry Herman and a superb libretto by Michael Stewart, it tells the story of a shrewd widow who brings young lovers together and finds a husband for herself (irascible Yonkers store owner, Horace Vandergelder) in 1890′s New York. Producer David Merrick made the difficult pre-Broadway tour a nightmare for the entire creative team, threatening to replace most of them at one point or another. 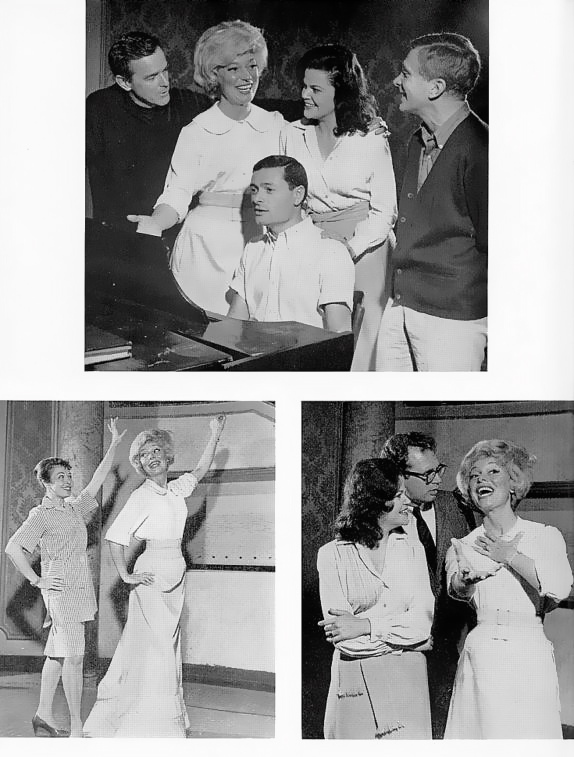 After extensive revisions, the show earned rave reviews in New York.BEFORE THE PARADE PASSES BY was added in Washington, D.C.. On the train to New York, Carol now knew that the show would be a hit. Champion’s staging gave Hello, Dolly! a stunning visual fluidity, evoking the gaslight era in a thrilling whirl of dancers and sets, capped by Channing’s luminous Dolly. Herman’s score caught the time period to perfection, with “It Only Takes a Moment” as the standout ballad. The catchy title number became one of Broadway’s all-time great showstoppers, with Channing descending a staircase to lead a line of waiters through a rollicking cakewalk. The number was considered a problem on the road, but Broadway’s opening night audience demanded (and received) an encore; choruses of apron-clad waiters have been escorting women of a certain age around runways ever since. An all-black cast lead by Pearl Bailey and Cab Calloway revitalized the show for hundreds of additional performances. At one point, Merrick claimed he wanted Jack Benny as a drag Dolly with George Burns as Horace, a bizarre yet tantalizing possibility that never was realized beyond the conversation. Mary Martin took the show on an international tour that ended in London. 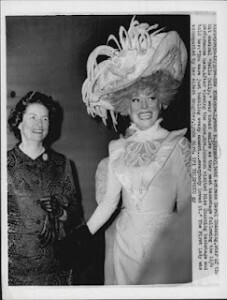 Ethel Merman was the original production’s last Dolly, making her final Broadway appearances in a role that had been conceived and envisioned for her. At the end of the day however, Channing was the woman who would become forever identified with Dolly, appearing in several revivals and performing the role more than 5,000 times over the years (Source: John Kenrick). Gower did not want Carol in the role. She had taken on the persona of Lorelei Lee off as well as on stage and he didn’t think she could shake it. Carol says she wasn’t upset: “You don’t have time to get crushed and still succeed.” Carol told Gower she gave him everything she had in Lend An Ear. She wanted him to allow her to audition. She auditioned for Gower at the St. James Theatre where they reviewed all of the major monologues from The Matchmaker. Gower would go across the street and watch Oliver! as Carol prepared for her monologues and scenes and then would come back to see what she was doing with them. Finally, she won him over and he said, “I buy what you’re doing”, as he embraced his new Dolly Levi! Once they had Carol in place, they knew that with her at the helm, the show would take on a unique flavor. Carol put her own unique stamp on Dolly Gallagher Levi. However, almost every popular actress “of a certain age” played Dolly. Channing’s Broadway replacements included Ginger Rogers, Martha Raye, Betty Grable, and Phyllis Diller. Pearl Bailey was adorable but difficult. When Merman finally tackled the part, she was magnificent. 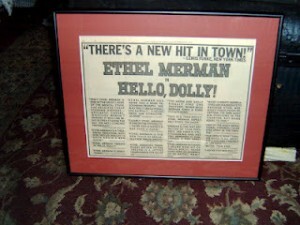 Jerry Herman said he secretly regrets Merman not doing it originally. 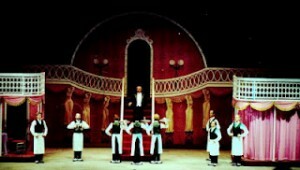 Gower choreographed the scenery and the flowers and the hat shop scene. He wanted everything to weave together. Thornton Wilder told Carol that he had re-written The Matchmaker for thirty-six years and was never able to bring it up to his expectations; that is until Mike Stewart and Jerry Herman and Gower Champion fixed it and got it where it should be. Marge Champion said until Gower got the idea of the ramp, he wasn’t even interested in doing Hello, Dolly! Gower would say to Carol, “You come down the ramp and I want you on this spot here, in fourth position. I don’t want second. I want fourth.” And she never missed! She said the way Gower directed Dolly! is riveted in her brain. Lee Roy Reams, who directed the 1995 revival, told me that he had trouble getting Carol to deviate from anything she had done under Gower’s direction. “She is glorious,” raved theater critic Walter Kerr, as Carol Channing made her appearance on stage wearing a carrot-colored wig and false eyelashes fluttering over her large, expressive eyes. It was a smash hit. It received ten Tony awards and was named Best Musical of the Year in 1963-64. Gower Champion had a definitive triumph with his direction and choreography of Hello, Dolly! The Original Cast Recording of Hello, Dolly! was inducted into the Grammy Hall of Fame in 2002. The show has become one of the most enduring musical theatre hits, enjoying three Broadway revivals and international success. It was also made into a 1969 film starring Barbra Streisand that was nominated for seven Academy Awards. Director Gower Champion was not the producer’s first choice to direct Dolly! ; Hal Prince, Jerome Robbins, and Joe Layton had all turned down the job of directing the musical. 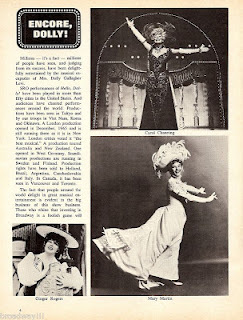 In 1978 AND 1995 Channing would return to Broadway as Dolly. Channing told Playbill, in an interview when it was announced that Midler would helm a revival in 2017, that thes last revival was the happiest year of her life and the best Dolly! company she’d ever worked with. On March 23, 2019 Carol Channing's friends and family assembled at The McCallum Theatre in Palm Springs, California, to pay homage to The First Dolly Levi, the first of so many to descend the stairs of The Harmonia Gardens and acknowledge Harry and Louie. It was a wonderful send off befitting a Broadway legend, produced by Chad Hilligus, the afternoon had Dori Berinstein (Carol Channing: Larger Than Life), publicist Harlan Boll, director John Bowab, Mary Jo Catlett (1964 company of Hello, Dolly! ), Kristen Chenowith, Carole Cook (Australia company of Hello, Dolly! 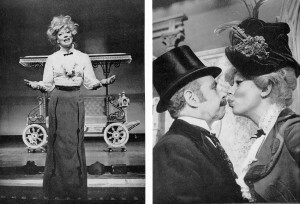 ), Tyne Daly, Davis Gaines (Cornelius Hackl,1983 tour of "Hello, Dolly! 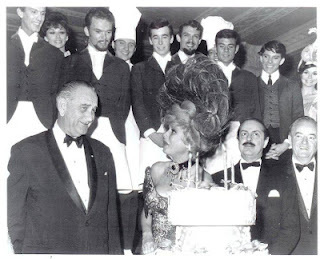 ), Ruta Lee (Dolly as Casa Manana). Gavin MacLeod (The Love Boat), Lynda Bird Johnson Robb, Lily Tomlin, and Alysha Umphress.